Fluffy, soft, moist and loaded with fresh peaches…Peach Fritters! Whisk the milk and confectioners sugar together until the desired drizzling consistency. Using a whisk, combine flour, salt, sugar, cinnamon and baking powder. Whisk in eggs, milk and butter. Fold in peaches. Heat oil in fryer or pan to 375 degrees F. With long handled ladle, ladle about 1/4 -1/2 cup batter into hot oil. The batter will sink at first and then rise. Cook for about 2 - 3 minutes, depending on size of fritters. Remove fritters from oil with long-handled tongs. Quickly drain on paper towels or newspaper. 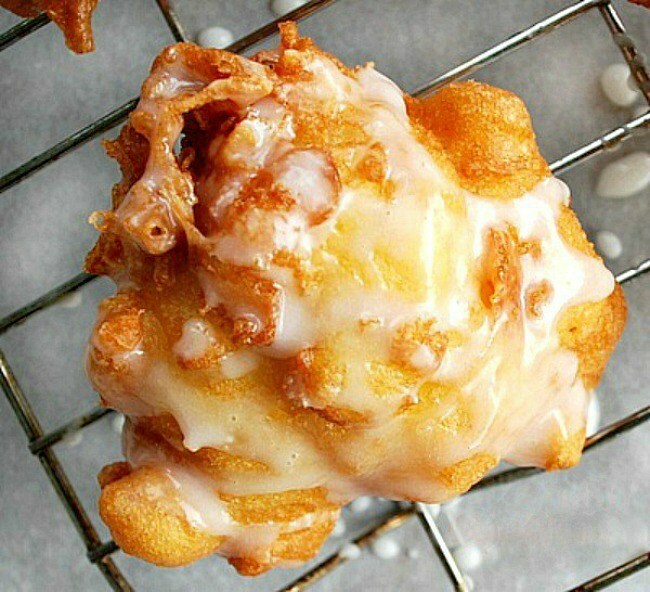 Then place fritter in bowl of sugar or glaze fritters. Coat with sugar on both sides, or glaze tops of fritters.